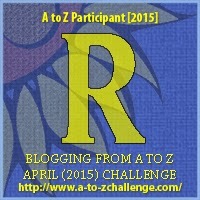 For this year's A-Z Challenge I have selected a word from the dictionary for each day and written a story around it with a 100 word limit. For extra interest I have chosen words that are unknown or unfamiliar to me. All definitions are from the Oxford Dictionary & Thesaurus 2007 Edition. Today's word is: Riparian. Riparian: Relating to or situated on the banks of a river. He enjoyed a riparian existence, sitting on the riverbank and casting out his line. This particular section was new to him and he was keen to see what he could catch. The bank had looked pretty solid, but as he stepped closer to the water his boot sank into the soft soil. He managed to pull it out with a “glop” noise, but when he put his other foot forward it was pulled down and he couldn’t move at all. “Help!” he shouted, but no one was around. His heart went still as something gripped his ankle and tugged hard. Uh-oh - I do believe he has stepped into something's trap. Not good for him at all! Great little story. My inner horror fan can't help but love the dark twist this took. Great story! Sounds like my childhood nightmares! I remember watching an old black and white movie called the Mole People?? They did that! Grab your ankles. Yikes. Maybe he will wake up and everything will be okay? Oh oh, I fear for our Riparian adventurer! Oh dear - you would have thought a riparian like him would know to take more care! Now there's a word I recognized. We have lots of riparian zones around here. Poor guy, just wanted a chill day of fishing, but sounds like he's the one that got caught. I had to laugh when I saw your title.... it reminded me of one of my favorite British sitcoms, Keeping Up Appearances.... The hostess, Hyacinth Bucket, or Bouquet, as she so often reminded people, was hosting an afternoon picnic with Riparian entertainment .... Too funny! This seems straight out of my nightmares. Yikes! Ah, one word I have heard before. Love the little twists to the stories you write, Nick. It started out as a calm and peaceful story and then became thrilling. Nice twist. I love this word. I find ways to use it just because. I enjoy a riparian lifestyle, too. Love the peace I find there. And guess what? I knew this word today. That's two for eighteen. Oh dear. Oh my. I'm worried. What.is.pulling.him.down??? Oops! That's unfortunate. I wonder what the derivation of riparian is? That is exactly why I don't like riverbanks. There could be something there. Riparian seemed like it would have such a happy context. Surprise! Remind me never to go fishing near that section of that riverbank. On a more serious note, you accomplished a lot in this 100-word flash fiction. Good for you. My heart would go still, too, if something I can't see, grabbed my ankle. Thanks, folks! As soon as I saw this word, I knew what I was going to write. True story: I was out walking the dogs at the weekend and came to a little stream in between fields. It looked innocent enough with little dirt banks, but I ended up with two feet sunk into sucking mud, straddling a stream. My 6-year-old was with me, pointing and laughing - not much help. I eventually managed to get out, minus one shoe. I tethered the pups to a fence post and went to get it to find the mud had covered it over, so I had to dig it out with bare hands. I tried to wash it in the stream which didn't work too well, as I then had one soaking wet foot. Sorry that this comment is probably longer than the story I wrote. Suffice to say I won't try anything like that again! Uh-oh! Strange river banks can be dangerous places! Something is lurking under the mud. I think we've all gotten a shoe stuck in mud like that. Yikes. Scary twist at the end. Ooh, creepy! Another great story, Nick. So much for relaxing near the water. Jeez! Something went fishing other than the human! I was twisted enough to laugh.